Ligament sprains are frequently a result of injuries sustained during skiing, the so-called "skier’s thumb." Thumb ligament sprains are also common in soccer goalies and rugby players. This injury is due to hyperextension of the thumb with subsequent injury to the ulnar collateral ligament. Symptoms include pain and tenderness over the inside of the thumb at the web space between the base of the thumb and index finger. Bruising can often be seen. Treatment is usually splinting, but severe sprains may require surgery. Minor injuries heal within 4 to 6 weeks, but more serious ligament injuries may take several months or longer to heal. Soccer and rugby players may prevent injuries with taping, while skiers may wear a brace. MRI can be useful in determining the extent of injury and if a patient needs surgery. Thumb fractures are due to direct trauma. Hockey players and skiers can be prone to fractures of the thumb. XRAY is often sufficient for diagnosis, but occasionally CT and MRI may be necessary for further detail and evaluation. Treatment is typically immobilization with a cast or splint. Surgery is reserved for more complicated fractures requiring internal fixation. Thumb fractures usually take 6 to 8 weeks to heal properly. 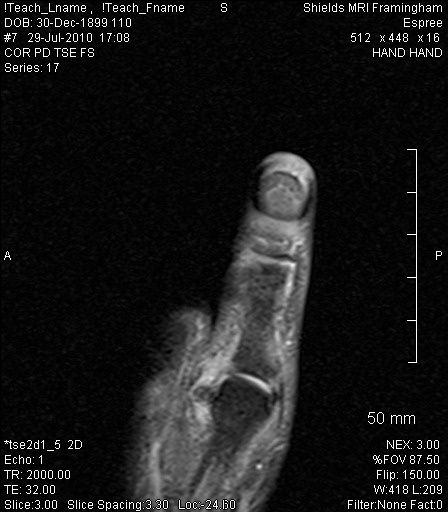 Muscle injuries of the thumb are uncommon. These are a result of trauma, either direct or indirect and may be associated with ligament or bone injuries. Indirect muscle injury can be due to forced contraction, such as rapid deceleration or acceleration, resulting in a muscle strain, pull, or tear. Muscles of the thumb are divided into intrinsic and extrinsic muscles. The adductor pollicis muscle has been in the news due to a recent injury to a high profile Boston athlete. The adductor pollicis muscle is responsible for 50% of thumb adduction. Adduction means to draw together. In the case of the thumb, this means to draw the thumb closer to the fingers. This motion is necessary for grasping objects, such as a piece of paper or holding a bat. Muscle strains are graded by severity. Grade 1 is the least severe; Grade 3 is the most severe. Symptoms of muscle strains include pain at rest worsening with movement or exercise, swelling, bruising, and weakness. Treatment includes the RICE regimen [Rest, Ice, Compression and Elevation.] Severe muscle strains may require surgery for repair. Recovery can take weeks to months. Stretching and warm-ups can prevent muscle strains. MRI is very sensitive in detecting and grading the extent of a muscle strain. It’s a good idea to follow the RICE protocol if you develop a sports related thumb injury and seek medical attention if the injury does not resolve within 24 hours or you experience significant swelling, severe pain or limitation of motion.